I've been making bread using a Breadman Pro breadmaker and mixes for quite some time. 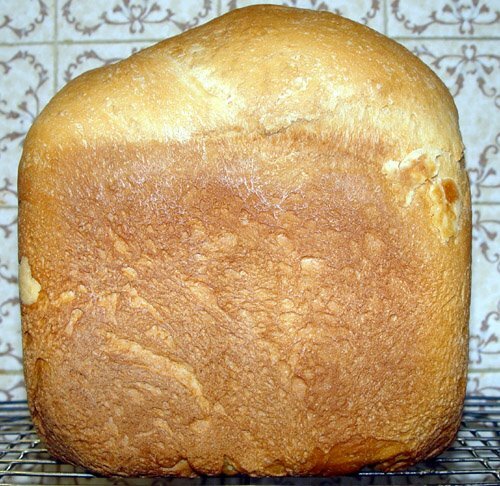 The results are good, but other than the nice smell in the home, it really isn't any more economical than buying a nice fresh loaf from the grocery store. Our local grocery store has an excellent bakery--the french bread is really wonderful. Today I took the plunge. We bought a huge bag of bread flour and yeast and I made my first "from scratch" loaf today. Because of the convenience of a breadmaker, it took all of 10 minutes out of my day putting the ingredients together. And the success of my first experiment? You be the judge! At pennies a loaf, this really is economical. The LaCie silverscreen allows you to move MPG files, audio files, and your photo library to this portable hard drive with connections for your television. Pretty neat idea for a gadget.